I’m nearly halfway through my tour of “The God Box, A Daughter’s Story” to ten cities and towns in Ireland and I’ve witnessed something quite remarkable. Yes, it’s the hundred shades of green and the gorgeous lilting accents and the faces– oh, the lovely faces of Irish people! 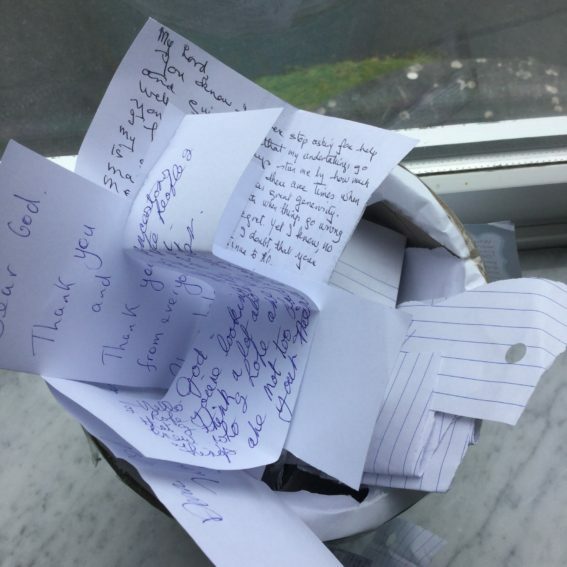 But The God Box story has left little footprints across this beautiful country– from Portlaoise to Cork to Kilkenny to Kenmare…in the form of tiny notes filling a simple God Box after each performance. While the TV news here might bemoan the recent budget or the downside of Brexit or even the contentious US election, the God Box is filled with hope. What is on the minds and hearts of Irish people? “Please help me find my one true love.” “Please give my grandparents a hug and a cup of tea.” “Please may my mammy get pregnant.” Letters asking for courage, for support, for safety, for comfort, for health. Many just saying thank you. Most are unsigned, simple petitions written in faith and love. Onward to Tralee and Limerick, to Sligo, Roscommon, Longford and Dun Laoghaire…hands on. This week I am setting out on a great adventure, one that my husband Joe and I have planned for nearly two years. Our goal was to bring my one-woman play “The God Box, A Daughter’s Story” to an extended tour of performances in Ireland and now it’s real. Below are the facts though at the m0ment, I am more consumed by my feelings. 10/30 Pavilion Theatre DUN LAOGHAIRE outside DUBLIN. All shows begin at 8PM. All tickets available through the theatres at 18 euros/15 concession and all proceeds support Local Hospices through the Irish Hospice Foundation. So, those are the facts. Here are my feelings. My heart is bursting with expectation, hopes and memories of my mother and father. Joe and I love Ireland so much. We’ve visited over 20 times over the years and I can almost inhale the sweetness and grace of that God’s green gift to us. I cannot help but wonder what my parents would say to the idea that I am sharing our family’s story of love and loss throughout the homeland of both their own mothers. I can only know that I will bring my heart to the stage every night and that the hugs I may give and receive on this beautiful Isle will stretch all the way to heaven. Hands on, Ireland! Joe will be with me and Martha too and of course, Mary! Here we come! Enjoy a free selected chapter from The God Box. Invite your book club to join this engaging conversation about Mary Lou’s book. Share these mini note cards or write notes for your God Box. The God Box app makes it easy to write notes on the go. Ask how Mary Lou can support your local cause with the book and play. Come meet Mary Lou and experience The God Box: A Daughter's Story at a venue near you. "A wonderful legacy…Keeping a God Box is an incredibly moving and hopeful ritual that we should all consider adding into our daily lives." "Mary Lou Quinlan shares her mother’s handmade and heartfelt gift of how to persist, believe and move forward with joy." – LEE WOODRUFF, AUTHOR OF "IN AN INSTANT"
"Mary Lou Quinlan has told the story of her mother in a way that entertains, moves and inspires. The thoughts about life and values will stick with you forever." "In the slips of paper that carry this sweet story forward, we can see the love in our own families and the great possibilities of simple faith." – JEFFREY ZASLOW, COAUTHOR OF "THE LAST LECTURE"
"The courage and wisdom from the messages left in her mother’s God Box will inspire you to create a God Box of your own." – GAIL SHEEHY, AUTHOR OF "PASSAGES IN CAREGIVING"
"A beautiful story of love, faith and family. It reads like an intimate, familiar prayer." – ELIZABETH GILBERT, AUTHOR OF "EAT, PRAY, LOVE"
"What a beautiful and profoundly human book....I will keep The God Box in my heart for a long, long time." – LAURA SCHROFF, AUTHOR OF "THE INVISIBLE THREAD"